Aussies are forming lifelong friendships via the use of apps. 64% of Australians believe that over the next 3-5 years, they will continue to benefit from using dedicated friendship apps to meet new people, as a preference to meeting people organically face to face. This trend is becoming increasingly popular with a technology obsessed generation. Through the use of the not so obvious apps such as pet sitting community, Pawshake, and dedicated friendship making platforms like Bumble and Hey! VINA, more and more millennials are taking to their mobiles to meet new people and develop friendships. Justine Faith is a bride to be from Concord who has lived all over the world, but decided to settle for an Aussie lifestyle when she moved to Australia from Singapore three years ago. After finding the perfect job as an Environmental Project Manager, Justine and her partner Esteban decided now was the perfect time to purchase their first ever puppy, Bodhi. With both of them working full time, Justine turned to online pet sitting community Pawshake, to find a trustworthy pet sitter who could take her adorable pooch for walks whilst they were out at work during the day. 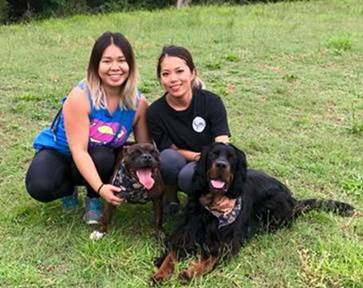 Through the use of Pawshake, Justine met Christine, a dedicated Pawshake pet sitter from Strathill who Justine quickly warmed to learning from her profile that their dogs had very similar interests, to soon find out that they both would too! Justine and Christine clicked the moment that they met, and quickly developed an incredible one of a kind friendship which started off with Christine looking after Bodhi with her dog, Bruno, in tow, to them going to dog festivals together, to girly nights out at the weekend leaving their doggos at home with their partners. Justine realised that she had found a very special friend in Christine, not to mention that both of their pups had become best friends too! Justine’s partner proposed to her in November 2016 and with hers and Christine’s unique friendship stronger than ever, Justine decided to ask Christine to be her Maid of Honour, and of course Christine said yes! The wedding is due to take place in September this year and Christine’s been busy planning and getting all of her Maid of Honour duties underway. This heart-warming story just goes to show that through the love of animals, a true friendship can blossom at anytime, anywhere!